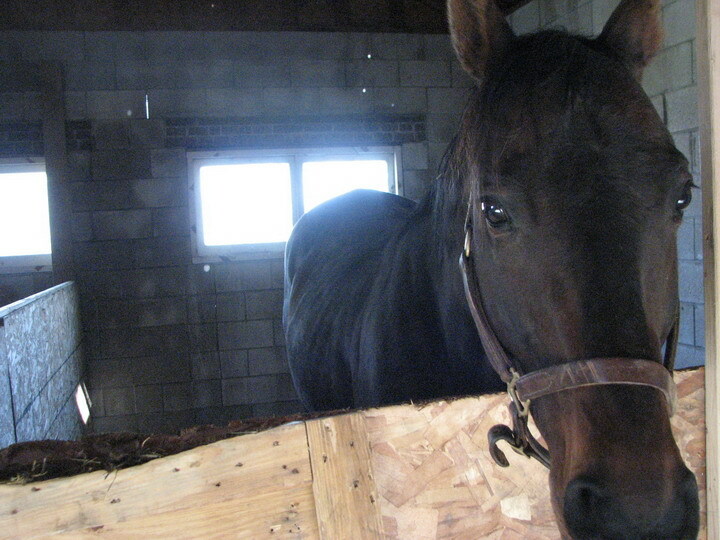 This is a tale of a racehorse. He won and placed in several prestigious races in his younger days, willingly running his guts out for the glory and enjoyment of his owner. The owner got the fame and fortune and the money. 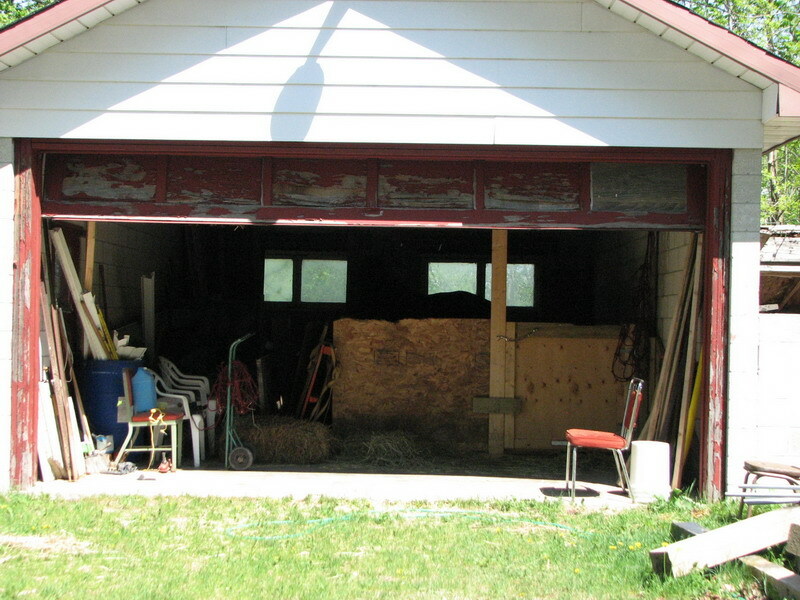 This is a common practice in order to TRY to recoup some of the money the farm owner has already spent in giving the horse the care that they need and deserve. Among those sold is ‘our’ subject horse Appalachian Chief, known as Chief for short. He is bought by a lady who had him for a while and cared for him appropriately. For whatever reason, this good owner sold him to the current owner. This is where his life in hell begins on April 1st2010. Some would say that this was a cruel April Fool’s joke for this poor horse. He was bought by a woman who has worked at the racetrack and various prestigious farms in the area for MANY years and knows very well how to care for horses – but CHOOSES NOT to. She brings Chief to his new ’home’. This ‘home’ is a garage with a chipboard cage on a cement floor. 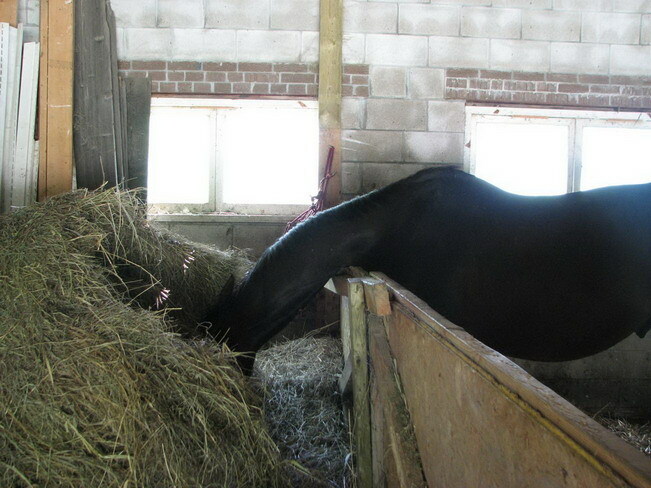 There is only a partially filled bag of hay and so he begins to live, without being able to stretch his legs for more than a trip around his approx. 7×12 foot ‘cage’. 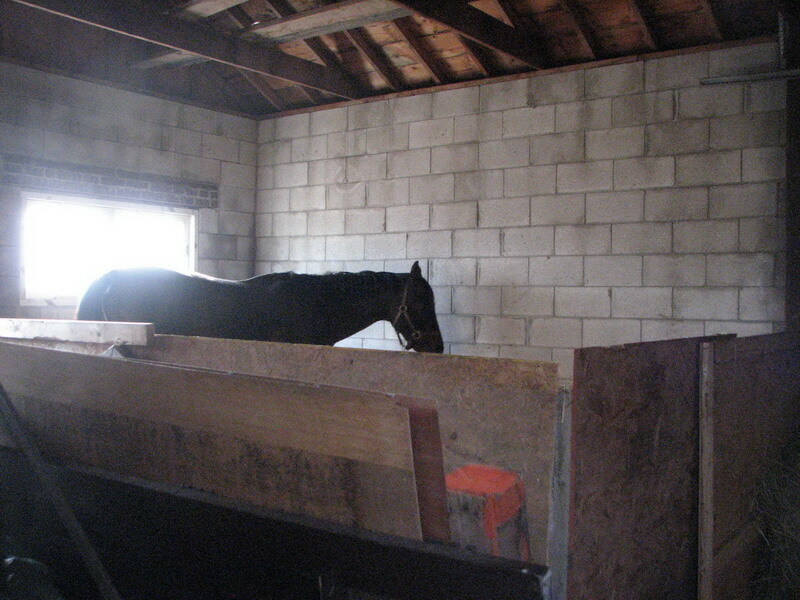 The very nature of horses is that they must be able to have the ability to move freely over a large distance which this prison does not afford. 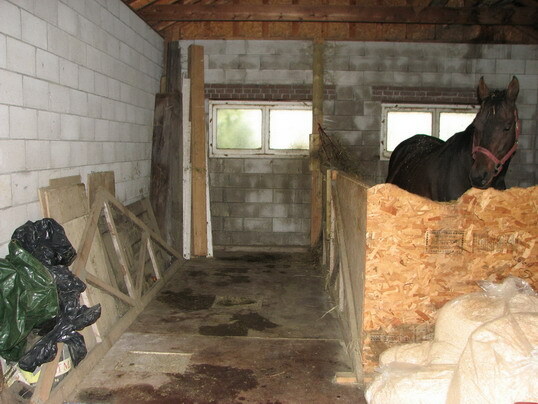 On April 2ndthe OSPCA is called by a concerned neighbour who is an experienced horseman and who lives nearby. They do arrive quite promptly and for the rest of the summer into the fall they pay weekly visits to Chief. Throughout the incredible heat waves we had this summer Chief would go for days without food or water. Had it not been for the concerned neighbour ‘trespassing’ and sneaking him a little bit of water and picking a few handfuls of grass, we have no doubt Chief would have died. 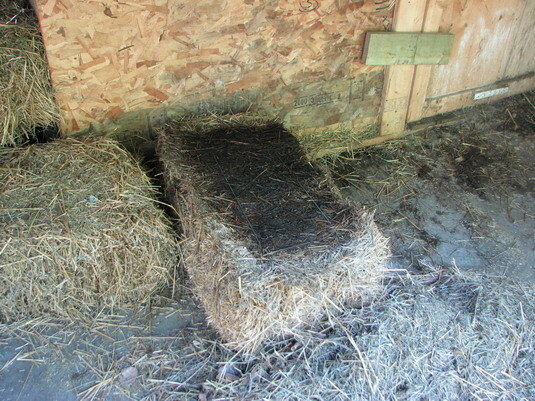 Eventually a round bale of nasty, dusty, moldy hay that not even cattle would eat arrives and is placed outside his stall so that he can eat it, sort of. It’s put just out of his reach so that swallowing is difficult. Chief stretching for his mouldy hay. 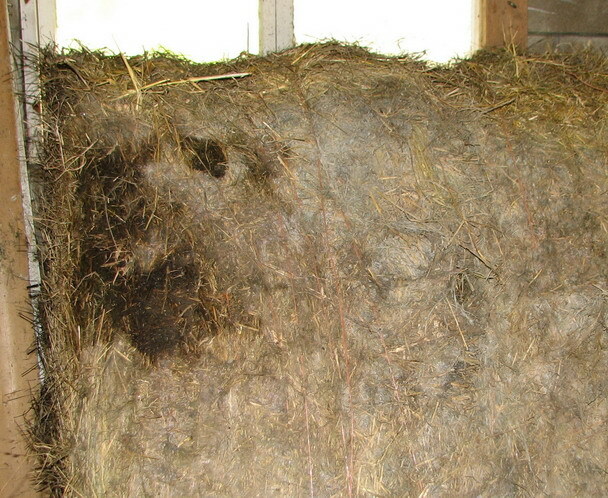 Yes, the grey stuff in the photo below of the bale of “hay” is mould. This the OSPCA deems as being acceptable. A great many people have offered to purchase Chief from the owner, just to get him out of there, but she loves the attention not the horse. 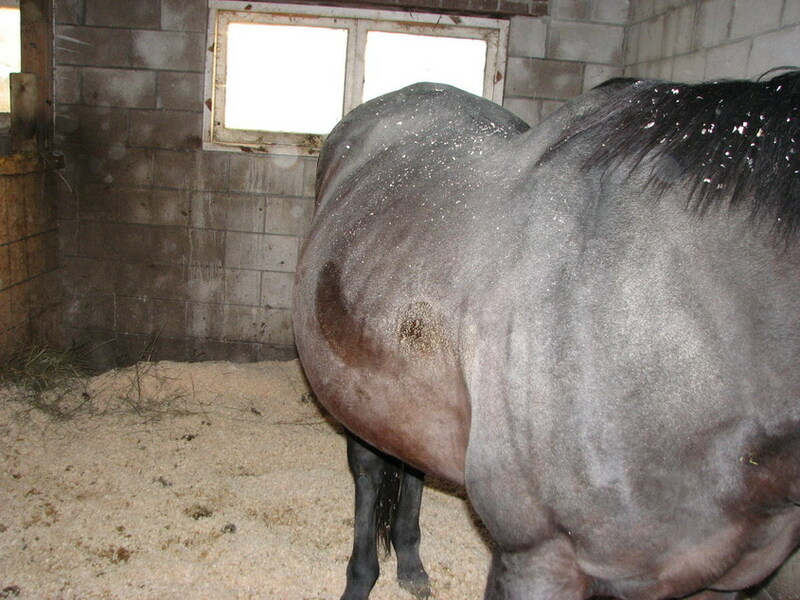 One potential buyer had to spend upwards of 4 hours listening to Chief’s owner tell them how smart she is, how she outsmarts the OSPCA by having food present because that is all they need to see, about how she wins ‘wrongful dismissal’ suits, about how she does not believe in feeding horses unless they are being worked! For those people who have offered to buy Chief from this woman when it comes to talking price she suddenly ups the amount she wants, often by double, and then caps it off by saying that she won’t sell him that she’d rather keep him so that she can write him off as a tax write off because he’s a “breeding stallion”. With Chief’s escalating decline in health he will never be any kind of breeding stallion. And so Chief stands, patiently serving his time in hell in this cage that was not cleaned out from April 2nduntil after June, count that, that is over 3 months of manure, ankle deep manure in the heat of the summer, with no cross ventilation, holes in the roof above his head allowing a steady stream of rain to add to the black, stinking manure, day in day out. Now, what does this have to do with the OSPCA? EVERYTHING! UNFORTUNATELY, THEY HAVE CONDONED AND FACILITATED THIS SITUATION. They have been notified many times about this situation that they eventually started making regular visits, same day of the week, same time of the day. They wanted to ‘educate her’ and left the owner brochures outlining how to take care of a horse, and reminding her that she should feed him. They would not ask or take into consideration all the people that were available to give references saying that she DOES know how to take care of a horse, but refuses to “’cause ain’t no body gunna tell me what to do with my horse, ain’t nun of their f..ckin’ business”. All of the people concerned for this horse have been long time OSPCA supporters and know that funds are often tight and it is harder to re-home a horse than a kitten (they are all horsemen and horsewomen) and have let the OSPCA know that they have raised funds amongst themselves to pay for this horse, have arranged transportation that is on 24//7 standby, have found several options for places for him, all in an effort to help the OSPCA, IF they did their job and seized this horse. This is met with a reply that they see nothing wrong and his care falls into the acceptable level of care as outlined for livestock and slaughter animals. 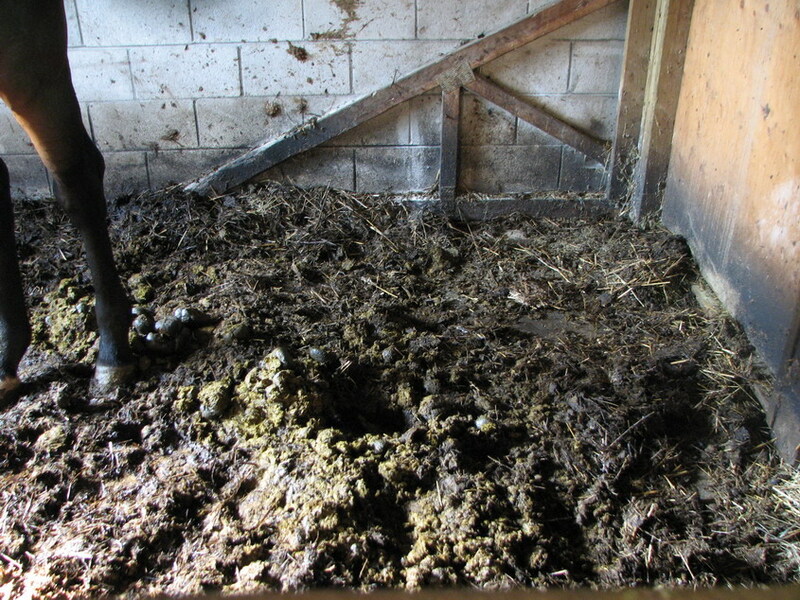 IF you read their own words on their own website about the necessary standards of care for ALL animals, it clearly states the animal must not be in unsanitary conditions, it must have access to food an water, it must not be willfully neglected…………. and they are allowing every one of those ‘rules’ to be broken. We are posting this story to raise awareness of Chief’s plight to implore our readers to demand that the OSPCA do the right thing and seize Chief and allow a reputable rescue take him and give him the good fitting home he deserves. We also want to ensure that the you the public are made aware of this situation. You have the right to, no, need to know where your donations are going and what is being done with the money. All of those cute little puppy and kitten and bunny calendars that the OSPCA sends out give a very misleading impression that they actually care about all animals and certainly does not come close to lifting the corner of that nasty little rug that they sweep these sorts of atrocities under. Please contact the OSPCA and your local MPP to express your opinion on this awful situation. And while you’re at it, tell them that the laws in Ontario and Canada have to be strengthened to protect all animals.